Tokara’s new DeliCatessen opened on Stellenbosch’s Helshoogte hill at the weekend. It’s an interesting business model when the financial outlay on interior décor and children’s designer play equipment would be unlikely to be offset in a hurry by a restaurant’s humble food and wine takings. I say this because the number of talented designers, artisans or artists involved in the project seemed to outnumber the lunch menu items. Don’t get me wrong: I like the white and light interior space dotted with Gregor Jenkin’s and Pierre Cronje tables and chairs, with inviting long couches in a lounge or benches on a deck. They’re designed to encourage people to linger over a newspaper or current magazine (also provided). Other big names include furniture-maker Norman Mehl; wooden toybox crates and a bookshelf cleverly reminiscent of jenga blocks by James Mudge, and a Heath Nash olive branch chandelier. 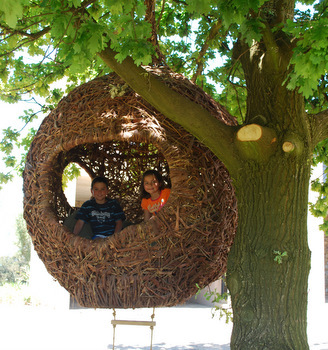 And my favourite, a treehouse in the shape of a weaver’s nest suspended from a leafy oak, designed by Porky Hefer of Animal Farm. The deli concept for adults is a la carte breakfast and cakes, plus a weigh-your-plate selection from the lunch counter similar to the likes of Melissa’s. A burger with handcut chips and homemade tomato sauce was delicious – I’ll be back. A kiddie’s menu should suit under sixes. Operated by Anne-Marie and chef daughter Kara Ferreira (busy in the open kitchen) with freshness and regional ingredients preferred, a plus is that the Ferreira’s extensive vegetable and fruit garden is regularly raided. Vineyard views are from the deck or the glass floor-to-ceiling enclosed space. But what most impressed are the moderate menu and wine mark-ups. The target market is yummy mummies and families, and if prices stay this way, the Tokara Deli won’t struggle to attract a loyal clientele. It makes a change from the neighbours, developing a reputation for offering a slick food and wine “experience” at an international price tag. We drove across the road to Delaire Graff Estate in the hope of ordering dessert and coffee. Their shady panoramic deck is an outstanding and inviting place to while away a few hours, and plenty were doing just that. At 3.20pm on a sunny Sunday I’m not surprised to be told - very graciously - that the kitchen isn’t serving food or dessert until 6.30pm. But I believe they’re missing a trick when ordering a glass of wine or a soft drink is acceptable, but enjoying coffee at the restaurant during a splendid afternoon is off limits. Have you ever thought about including a little bit more than just your articles? I mean, what you say is fundamental and all. However imagine if you added some great visuals or videos to give your posts more, "pop"! Your content is excellent but with pics and videos, this site could undeniably be one of the most beneficial in its field. Fantastic blog!